“Lighter .. Faster .. Stronger” could not be a more appropriate motto for the new Raine BLACK Vector LCP. Vector LCP (Load Carry Platform) is Raine’s new “no webbing MOLLE solution”. 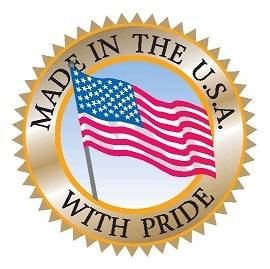 The platforms are made using a nylon coated material and is Made in the USA and Berry Amendment Compliant. They are laser cut and are not laminated with Cordura nylon fabric. 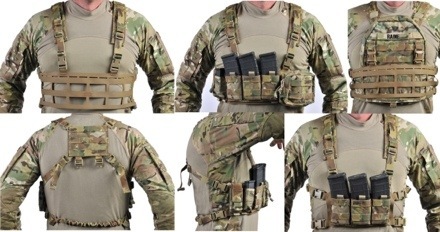 The biggest advancement in this material, unlike other fabrics in its category, is the pull strength we were able to achieve on a single MOLLE channel. We originally unveiled this at the SHOT Show post pull testing and spent some time with some large human beings trying to rip it apart (standing on it and pulling, two arm pull, then tug of war), which they failed to do. In the current configuration, Raine is running these in a large and a mini, which is what’s currently in the warehouse. They are fitted with a standard cut and sew harness with laser cut harnesses in the works. They are in the process of getting harnesses assembled and attached as we speak. That said, split front systems have been prototyped and are ready to go to the laser cutter now. Quickly following will be our armor carrying systems. We have some really great things in the works on that front and will be ready to show them very soon. There are currently 800 being put together, 400 of each for the small and large sizes. Both the Small and Large Rigs are offered in Coyote, MultiCam, and Foliage Green. The products are available July 21, 2013. To pre-order, call Regena at 1-800-826-5354 or email her at rainemail@raineinc.com. Please also note: This is not Rack Minus, nor is it a poor man’s version of Rack Minus. This is a stronger woven coated fabric than what is used in the industry currently for the no webbing MOLLE application. The application of nylon woven coated fabrics in a MOLLE configuration is not new, and Raine has not claimed to invent it. However, the guy who led the way for industry in this innovation worked with Raine to design this product and its capabilities. Raine continues working to advance the materials and looks forward to your future feedback. This entry was posted in Made in the USA, Raine's Products and tagged Berry Amendment Compliant military products, Made in USA military products, Made In USA Vector Load Carry Platform, new military product development, Raine BLACK product line, Raine Made in USA military products by raineincblog. Bookmark the permalink.